The entire team at SYED loves to be a part of special days in all cultures, and this time around we were lucky enough to stylize one of the cutest little Korean 100 Day Celebrations- ever! 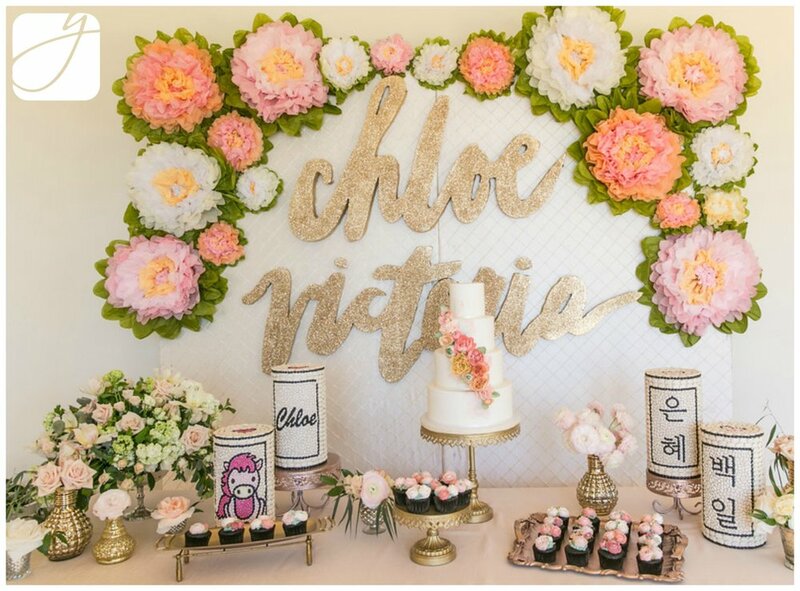 Baby Chloé had a 100 Day Celebration that rivals many beautiful weddings! Korean culture places a special significance on the 100th day after a child's birth. This day signifies the survival of a trying time (for both the baby and his/her parents!) and is most definitely fit for a celebration. Lucky for this little girl in particular, she has two amazing parents that brought in some of the best vendors around! 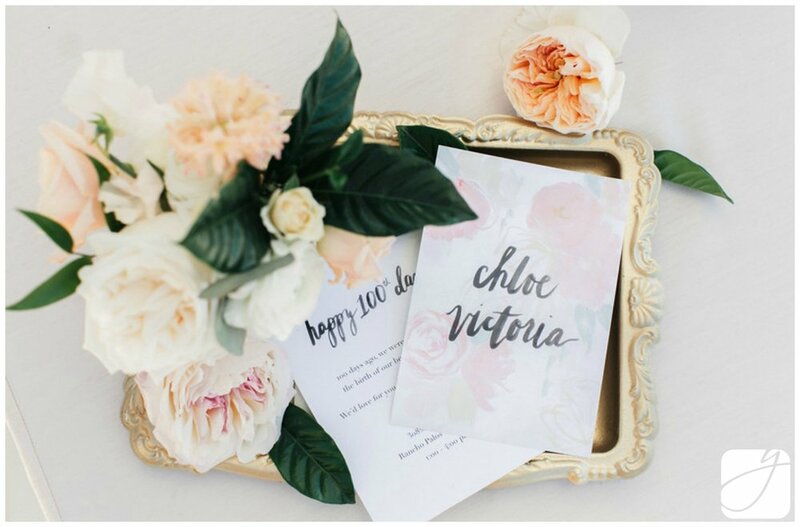 Thank you to Jana Williams for the flawless images that showcase our designs so well! The team at Our HeiDay created these beautiful invitations that we based much of our design off of! 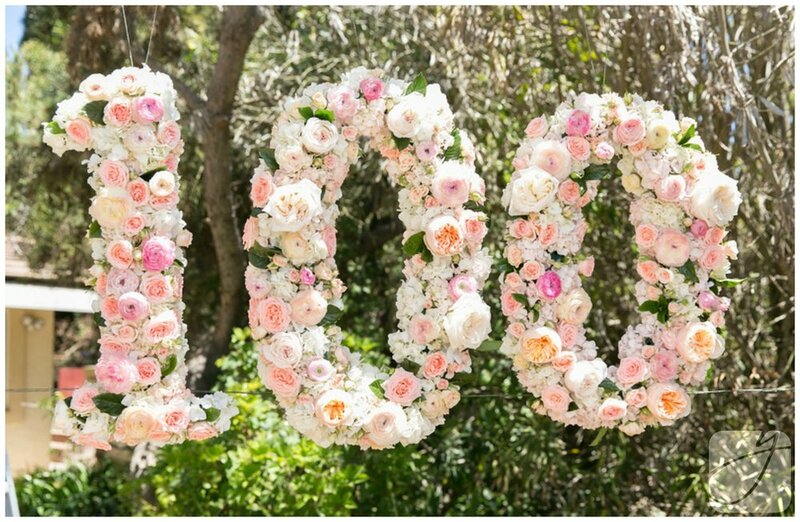 We created and suspended this lush "100" sign above one of the lounge areas. The vintage furniture from Found Vintage Rentals added so much beauty to our designs! The Jamie Blush sette (as seen in the image below) is the perfect size for cuddling and was the perfect color! Our super cute 8'x 8' backdrop stood tall behind assorted traditional Baek-il 백일 items. We created an arch made of tissue paper flowers above signage designed by the amazingly talented team at Our HeiDay. We did what we do best and took their design, magnified it, carefully created the custom cut out, and covered it in our favorite gold glitter! 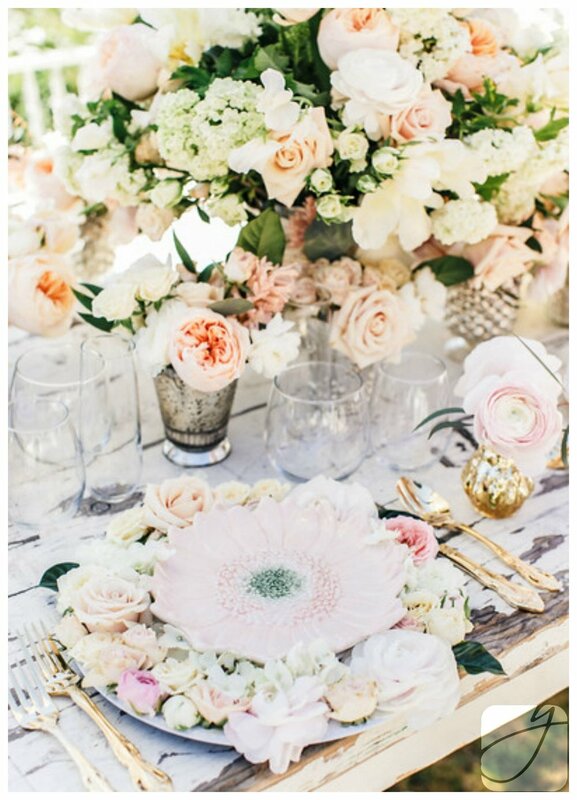 This beautiful king table featured a lush peach, white, ivory, and blush design to complement our vintage ivory tabletop. Chiavari Chair Rentals' tuscan ivory chiavari chairs with ivory seat cushions paired with this look wonderfully. The two Jacey White Chairs that sat at the end of each table added such warmth to the design. 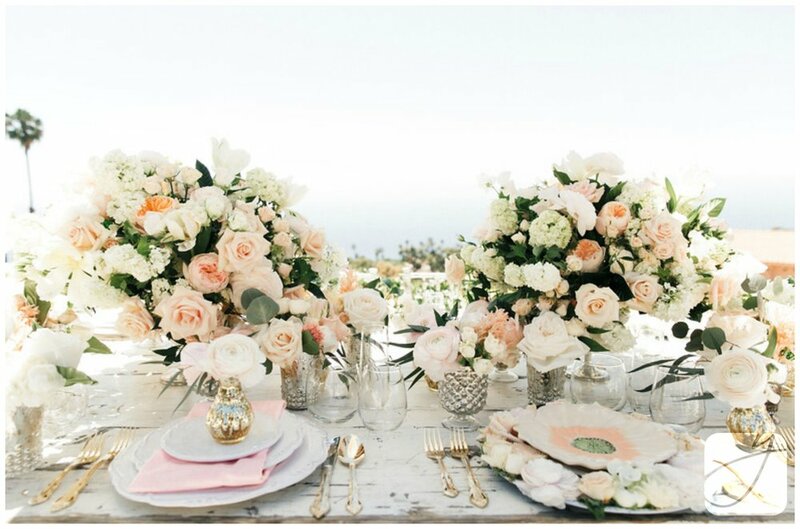 While the long and linear tables used Found Vintage Rentals' Hawking White Table, our 6' square tables featured a beautiful Peach Pink Shantung linen from Luxe Linens. We always love it when our clients choose to go with unique flatware and stemware, and that's just what we got for this event! Elegant rose gold stemware and flatware from Chiavari Chair Rentals sat next to our beautifully executed place settings. 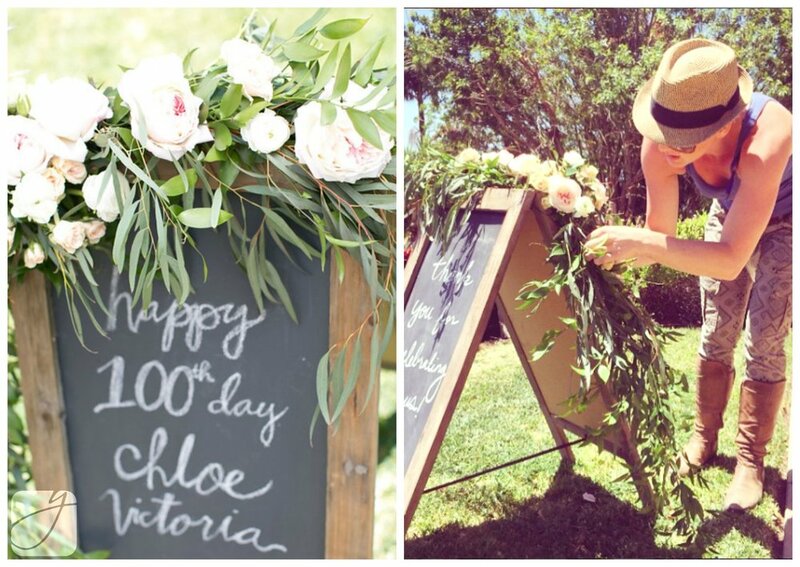 We had an awesome time decorated this chalkboard sign with an accented garland! And wow- we cannot forget about the spectacular dessert table! The cupcakes and cake from Miso Bakes had the most realistic flowers ever! They were so adorable and paired so nicely with our antique rentals and petite florals. Chriselle herself posted a beautifully personal recount of this day (and its significance for her and her family) on her blog- which you should totally go check out!